The Kingdom of Tonga, a group of islands in the South Pacific, is facing the consequences of climate change. Cyclones and hurricanes wreck havoc on the islands with greater frequency; the strong currents and powerful waves have eroded the land upon which houses are built; rising sea levels and drought have reduced the availability of fresh water for domestic and agricultural use; and fish and oysters that used to be found in shallow waters are no longer as present so families are struggling more to find the food they need. Even prior to the difficulties climate change has created, Tonga had limited opportunities for its people, and poverty and hardship affect a number of its communities. There is a growing pressure of youth unemployment – only 20 percent of young people are in formal employment. This unemployment threatens stability and long-term economic growth. 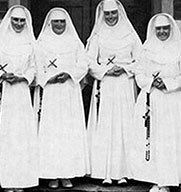 In 1964, Bishop John Rodgers sm, who was from Aotearoa New Zealand and serving in Tonga, approached the Sisters of Mercy in Christchurch, Aotearoa New Zealand, with a request that they establish a house in Lapaha, Tonga. 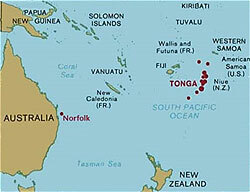 The sisters agreed and sent four people to Tonga. The founding sisters taught school, worked with the villagers in raising crops and pigs, and ministered to the people in a host of ways. In 1991, a second house was opened in Kolonga. Today sisters in communities at Kolonga and Lapaha are engaged in secondary school teaching, parish work, support for women and children, prison chaplaincy and justice and development programmes. 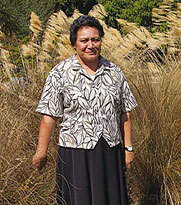 Senolita Vakata rsm (pictured at right) is the director of Caritas in Tonga, and the Sisters of Mercy work closely with Caritas on education, justice, and development programmes. Caritas Tonga has played a vital role in coordinating relief and rehabilitation projects over the years, such as the construction of cyclone-strength housing for vulnerable families. Through projects such as the Tonga Community Development Programme, Caritas Tonga is working to restore dignity to families with low incomes and unemployed young people so that they can eventually become self-reliant. The beneficiaries run the projects so that young people are employed in initiatives of their own making, thereby ensuring long-term sustainability.